Radiation therapy after mastectomy is not always necessary for women with low-risk breast cancer, but it is frequently recommended for high-risk breast cancers. For intermediate breast cancers, use of radiation therapy after surgery remains controversial. Following the publication of three landmark trials in the mid- 1990s showing that post-mastectomy radiation therapy decreases locoregional recurrence and improves survival in patients with high-risk breast cancer, rates of this type of radiation increased from 36.5% to 57.7% from 1996 to 1998 (Table 1). In the late 1990s, several major associations released treatment guidelines endorsing the use of post-mastectomy radiation therapy in this population, most notably the American Society of Clinical Oncology and the National Comprehensive Cancer Care Network. Why the Disparity in Post-Mastectomy Care? Falling on the lower spectrum of high risk (fewer positive nodes or smaller tumors). Having ductal rather than lobular breast cancer. Having larger tumors not growing into the chest wall or skin vs T4 tumors. 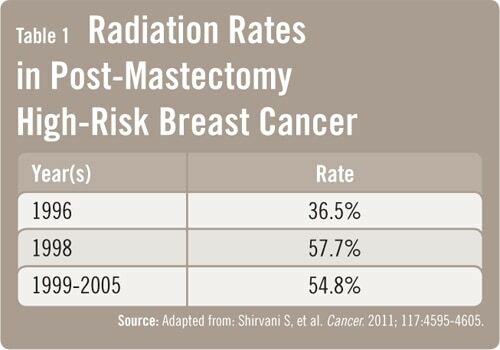 Beyond the patient and provider factors that affect post-mastectomy radiation therapy and practice (Table 2), Dr. Smith says that post-mastectomy radiation was not thought to improve outcomes significantly until the mid-to-late 90s. “We may still be in the phase of trying to engrain the importance of this change within the prevailing medical culture.” In addition, patients may have high-risk breast cancer because they neglected it to a certain extent or were unable to access screening, which could suggest that they may not be able to access radiation therapy. Shirvani S, Pan I, Buccholz T, et al. Impact of evidence-based clinical guidelines on the adoption of postmastectomy radiation in older women. Cancer. 2011; Jun 27 [Epub ahead of print]. Available at http://onlinelibrary.wiley.com/doi/10.1002/cncr.26081/abstract;jsessionid=F582458DBE3460303CD2074111FAB1AB.d03t02. Smith B, Pan I, Shih Y, et al. Adoption of intensity-modulated radiation therapy for breast cancer in the United States. J Natl Cancer Inst. 2011;103:798-809. Smith B, Haffy B, Wilson L, et al. The future of radiation oncology in the United States from 2010 to 2020: Will supply keep pace with demand? J Clin Oncol. 2010; 28:5160-5165. Pinitpatcharalert A, Chitapanarux I, Euathrongchit J, et al. A retrospective study comparing hypofractionated radiotherapy and conventional radiotherapy in postmastectomy breast cancer. J Med Assoc Thai. 2011;94(Suppl 2):S94-S102. Christensen B, Overgaard J, Kettner L, Damsgaard T. Long-term evaluation of postmastectomy breast reconstruction. Acta Oncol. 2011; Jul 11. [Epub ahead or print]. 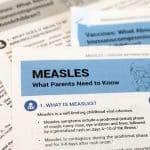 Available at http://informahealthcare.com/doi/abs/10.3109/0284186X.2011.584554. Benjamin D. Smith, MD, has indicated to Physician’s Weekly that he has received grants/research aid from the American Society of Clinical Oncology, Varian Medical Systems, and the Cancer Prevention & Research Institute of Texas. I have had a mastectomy of the left breast and Level 1 and 2 axillary nodes removed. Right breast is clear. Tumor was under 2 cm, 2 sentinal nodes were positive, (therefore, 19 nodes were removed and 2 were positive). I have no genetic mutations, am estrogen positive (58%) and HER2 negative. I am 69 years old. One medical oncologist recommends no chemo (since my oncological number indicated no improvement with chemo added to hormone pill therapy) and no radiation. My breast surgeon wants me to consider radiation. I interpret the guidelines for post-mastectomy in my case to favor NO radiation. Is this correct. Sentinel node negative clear margins , breast tissue clear of malignancy. 3 nodes believed to be positive at one time. Radiation. Had stage 3a lobular invasive carsonoma.